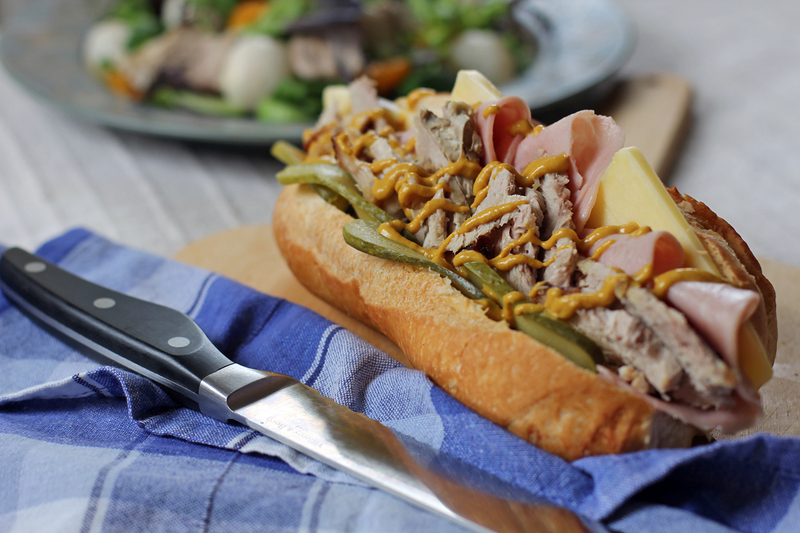 This series would not be complete without this sandwich as this is the mostly suggested dish when people ask for recipes that uses left over pork roast. Cuban sandwich basically is a popular variation of the ham and cheese sandwich, it was created for early Cuban migrants in Florida as well as Cuban cigar factory and sugar mill workers in Cuba during the late 1800s. Later salami started to show in this sandwich due to influence of Italian immigrants in Florida. Also called as the “Cuban mix”, “mixto” or “Cubano” this sandwich is made out of roast pork, ham, Swiss cheese, pickles and mustard over a Cuban bread then pressed and heated in a sandwich press called plancha. Slice long bread lengthwise and spread mustard on one side and mayonnaise on the other side. Fill middle with layers of pickles, roasted pork, glazed ham and Swiss cheese. Prepare a lightly greased griddle, heat griddle and place sandwich. Using a clean heavy skillet place it on top of sandwich to press it while heating, press bread until its half of its thickness. Heat one side in medium heat for 3 minutes then do the same process for the other side. Slice into 4 portions then serve. I’ve never seen cuban sandwich before. It looks delicious and I love how simple it is to prepare. Having lived in Florida, I certainly have eaten my share of Cuban sandwiches. Cuban sandwich is probably my go-to sandwich for pork leftovers after coming to the US. What a delicious combination of flavors! But I confess seeing this yummy sandwich has made me think of something else I’m now craving for: a “serranito” (pork, serrano ham and fried cubanelle peppers sandwich). Easily one of my favorites! Ham, pork and swiss.. sounds fantastic. Would any sort of bread/bun work?? This looks like my kind of sandwich!!! I like them extra meaty! Oh yum! Loved pressed sandwiches and pork leftovers as innards sound very appealing! And pickles!!! Didn’t realize it was a Cuban dish. Wow, look so delicious huh! Will try this if i got home..
I’ve not eaten a cuban sandwich before, but it sure looks delicious! This is one delicious looking sandwich. We have a Cuban bakery down the street that serves these and it really is the ultimate sandwich! Great re-creation! I’ve never had a cuban sandwich- I’m wondering if there would be a good vegetarian substitute for the pork? I had my first cuban this year and feel in love with sandwiches! I’m not much of a sandwich eater, but this one is delicious. thanks for sharing the recipe! Now I know how to make it. Great recipe! I used to live in Florida, and this is exactly how I like my Cuban sandwiches prepared. Excellent post – thanks. I love Cuban sandwiches. I’m not even a big fan of mustard but on this sandwich it’s perfect. I like eating mine with sweet and spicy pickles. I’m salivating! I love Cuban sandwiches. I don’t even like pickles or Swiss cheese, but I eat it all if I’m having a Cuban. Cuban sandwhiches are so yummy !